The warm weather allowed us to get out of the greenhouse and into the garden! Our first order of business was soil improvement. 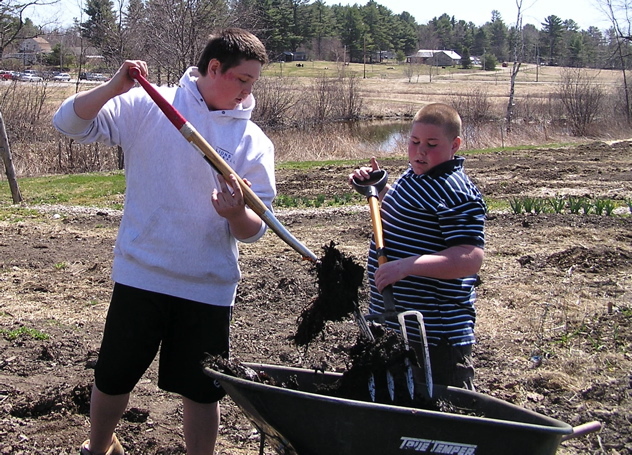 The kids have been spreading compost and leaf mulch throughout areas which are in need of organic matter. A new heirloom tomato garden was made in the courtyard outside of the library. We cut sod in two half circles around the library garden so visitors can walk through and view these old timers in action. This allowed the kids to see very raw THMS soil which is not a pretty sight. They will be involved step by step in the soil improvement process which I hope will make an impression.